Then I just step out of the way. 20 problems are then solved. In lightening fast speed. And all are correct. But, something quite unexpected is happening with the boy child. “Jensen, this vacuum is just like a CAR-CAR! Look! It has wheels and goes VROOM-VROOM!” And so, he commandeers my beloved Shark cordless vacuum. I may have sprained my arm, patting myself on the back. This sounds awfully good on paper. But, now he won’t give it back. He runs it down until the red light is blinking wildly for mercy, begging to be plugged in so that the battery can recharge. And people, it’s not like he’s doing a great job cleaning. Somehow, someway, HE’S MISSING ALL THE DIRT. AND THE NOISE. Oy. When the battery is long dead, he continues to vacuum making his own Jensen The Human Vacuum noise. A sound which should only be heard by wild mad dogs. He’s now branched out to show his love and adoration to the Shark’s extended vacuum family, housed in the front closet, containing the Bissell Steam Vac and Bissell Cyclonic 12 Amp Vacuum. I don’t let him operate either of these, because of the electrocution factor. Since he started licking the electrical outlets at age 15 months, we try to prohibit him from operating anything electrical. But he talks about them ALL THE DAY LONG. And wants to visit them in the front closet. I’ve come to the conclusion that he gets his obsessive from me. And the compulsive? That’s from his father. Maybe we just need to let this run its course. But on a recent trip to Lowes, Fiddledaddy tried to interest him in the John Deere riding mowers. Nothing doing. He headed straight for the “wacwoom” display. After a reasonable amount of time was spent admiring the many models, the attempt to extricate Jensen from aisle #12 drew a crowd. Now, on Sunday mornings, he peruses the paper with his dad. They don’t haggle over the Sports page, or the Outdoors section. Jensen goes right for the circulars, in search of the latest model of vacuuming excellence. On sale. We have a family bulletin board in the center of the Fiddle household. On it, we tack up well loved pictures, things we’re grateful for, and stuff for our “I wish, I wish” list. Jensen taped up a picture of a Dyson vacuum. You know, the $500.00 model. In bright canary yellow. I’m praying for his future wife, you know. And it seems to be working, because she’s gonna get a gem. If I can just steer him towards All The Dirt. Updated to Add: Crista just sent me this link and this one. Help. Me. Too funny. My boys also seem to prefer the vacuum as a cleaning tool. I suppose a power tool is a power tool. When we lived in England my 3rd (and then 2 yo) son had a “love affair” with a canister vaccuum named “Henry”. “Henry” was printed in bold red letters across his forehead (the vaccuum’s) and he had eyes, a large smile, and the hose was his nose. Henry would spend the entire day out and about, being taken everywhere my son could drag him. But I’m here to tell you that teen boys miss all the dirt as well! And, pun aside, I would try and explain all the dirt missing: since it’s fully acknowledged that men (as a whole) clean a- only when they can’t walk without stepping on something that hurts and b- stricltly in the places where they recognize the hurting dirt from a full upright position, maybe Jensen’s male genes forbid him to notice all the dirt you can notice from your considerable height. I’ve been studying this behaviour while with my ex boyfriend: he was sharing a flat with other two men, and the bathroom was nearly acceptable as long as one stood. As I sat on the toilet, I noticed what I though were shadows, and they were not. Because they were thick, and far too dark. And I didn’t clean the bathroom for them, because I might have female genes, but I also have a dignity. And a low resistence to gag. Ok, I couldn’t resist this one; maybe one day Jensen can be on the Ellen Show too? Oh this brings me back! My boy (almost 9) loved vacuums! Love them. We used to call Lowes the vacuum store. Yes he will grow out of it but enjoy it! That pun would be funnier if my husband didn’t say it every. single. time. I vacuum. And since he works at home and I vacuum often, he says it, A LOT. 12 years a lot. A thought: what if you deliberately put some thing vacuumable on the floor so he could see how to do it, like vacuum salesmen do? I don’t know. My son, you see, loves the vacuum but only the cleaning attachments and vacuums the entire floor by hand getting all the big stuff. It takes hours but he loves it. He is all about picking up tiny things one at a time, like rice and cheerios. We eventually just bought our son one of those children’s vacuums that really picks up. It is much quieter, the battery lasts longer and he loves it. We found ours for under $20 ar Walmart! Rent him out! He will love to see all the models of vacuums at the other houses! And see, I couldn’t get past the photo. A boy who lives in Florida wearing fleece footsie pajamas? I didn’t know they sold fleece south of the Mason-Dixon line. Why you need fleece, summer-girl? I wish that kid lived closer to me, we have a woodstove in our living room, main source of heat. I’d pay him to vacuum!! Yeah, the kid in your first link (and maybe in the second — I can’t see streaming video at work) sounds like the kid I saw on an episode of “Modern Marvels” recently. Too. Much. If I want someone to do a bad job, I’d just do it myself. Our Wonder Boy is a vacuum maniac! A trip to the Hoover store for belts? He’s on it like a duck on a junebug! Over the years, he’s received 11 vacuums for various birthdays and Christmases. He’s 8 now, and is the Head Vacuum Operator in our house. His room is decorated in vacuum banners, posters and calendars. Seriously. I taught him to do the job well using Arm&Hammer Carpet Fresh. Sprinkle it on, he vacuums it up, and I can easily show him the spots he missed. The feeling of accomplishment he gets from it is priceless. And the house smells pretty good too. I love the Ellen video! Can your son identify the logos? Watch out! When my big giant kids were little and cute, I read them a story about an alligator named Monte. Then one of them made the comment that the vaccuum was just like Monte. From then on, that has been our vaccuum’s name with each succeeding vaccuum, just like all the Lassies used to play the one Lassie. I used to chase them with the vaccuum, and they loved it. I think this story about Jensen is about the cutest thing ever. I wish someone in this house would decide to love a sweeper…not going to happen. Maybe Jensen will invent a new, improved vacuum! Or build a vacuum retail empire! Both sons had/have an odd attachment (pun intended) to our vac. Oldest son, now six won’t even enter a room if the vac is in sight. Youngest son, however remains loyal and digs watching the bits o’ dirt disappear. He’s also tried to make his sister disappear. Another story altogether, but, in fact, not unrelated. That is too funny! You inspired me to get a Shark cordless vac and I LOVE it. My kids want to use it all of the time, but it’s my baby so for now- no dice. We gave my son a toy vacuum for Christmas. It’s his favorite toy. He also has his own Swivel Sweeper. 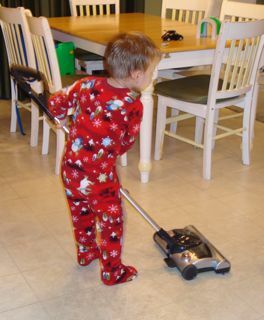 We have two sweepers, as well as two other children, but the little Sweeper is his. He’s actually quite good at getting the dirt. And then he puts it away, tidies up the closet and closes the door. For real. He’s almost two and a half. He also closes cabinet doors, and puts his potty seat away. I’m sure it won’t last, but it’s funny while it does!